Using a mobile optimized and widely popular platform is the first step in future proofing your website. A condition fulfilled by a responsive WordPress theme. In this article, we’ll cover some best known practices to help future proof your WordPress website. In this announcement Google stated that site load time or website speed is now included among its 200+ ranking factors. This means that website speed will have an important effect on how Google ranks your website in search engine results pages (SERPs). With organic traffic accounting for the majority of web traffic on some sites, you certainly don’t want to miss out on that kind of potential traffic. While a number of factors affect the load time of a website, using a good hosting platform is perhaps the most important of all. A good hosting company should provide optimized tools for WordPress users. This is usually a staging area for testing themes and plugins before finally releasing it to the public. Articles such as Speed up Your WordPress Website and Separating the Good WordPress Hosts from the Bad will help you choose the right host that caters for serving clients using WordPress. Practicing good security measures such as using strong passwords, not keeping backups in a public-accessible folder and regularly updating core WordPress, themes and plugins will also help you protect the integrity of your website. Akismet , Wordfence Security and Sucuri are popular and effective plugins for controlling preventing spam and malware attacks. Finding the perfect web design is hard and most websites iterate their site design through various tests e.g. A/B testing to find the perfect web design that would optimally capture leads and win more customers. With many site owners resorting to freelance web designers or agencies, it’s important that over reliance is avoided. Copies of code changes should be made. Passwords and key configuration changes should also be documented. This makes it possible to make appropriate changes in the future and avoid being left in the cold, not knowing or forgetting what was done in the past. This also applies to the usage of themes and plugins. Consideration has to be made when selecting theme frameworks. Only popular and well-supported themes and theme frameworks should be used. Also, all-in-one plugins should be used sparingly. This will ensure that the website’s core functions are not broken whenever modifications are being carried out on the plugin. With WordPress constantly releasing improvements and bug fixes, it’s important to ensure that all installed plugins are compatible with the latest WordPress version and adhere to latest WordPress standards as stated in the WordPress Codex. The latest WordPress version makes checking this easier. When searching for new plugins or themes, a tab is shown whether it is compatible or not. Using a non compatible or poorly developed plugin or theme puts the security of your site and visitors at risk. Non compatible themes or plugins also suggest the developer has potentially stopped fixing bugs or offering support. Theme Check is a popular plugin that helps test your theme and make sure it’s up to scratch. This article gives some additional ways to protect yourself from rogue plugins. While a good hosting company might periodically backup your website data. You should also do this yourself and keep a copy remotely (e.g not on the same live server). Doing this will help ensure when tweaking your website, if you run into issues you can always restore from a recent backup. There are a good number of platforms and plugins (both paid and free) that do a good job of backing up your data. 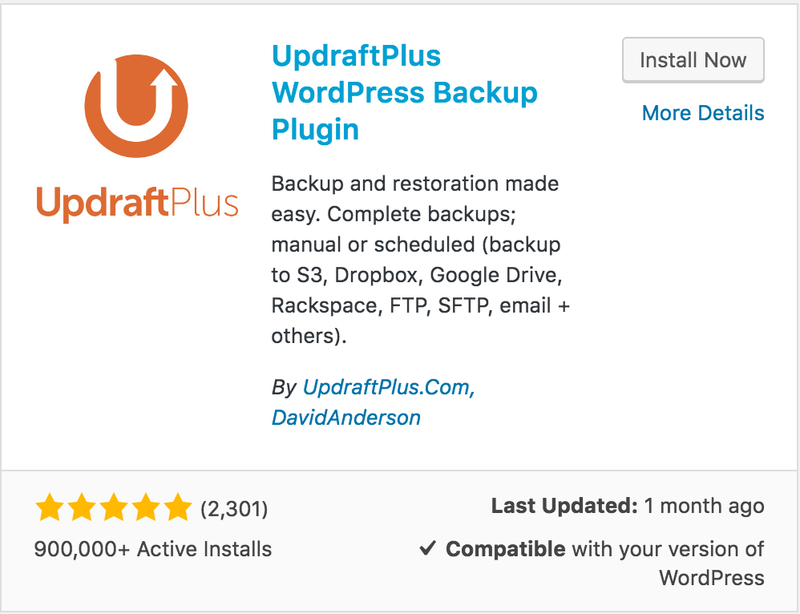 BackWPup and Updraft Plus are a couple of popular backup plugins. If you, however, would like to backup your site manually, this article is a must read. You should also maintain your site, we’ve got a great guide on WordPress maintenance here. A child theme is a theme that inherits the functionality of the parent theme. When you make changes to the child theme, it overrides the defaults from the parent theme without touching or breaking files in the parent theme. This allows you to update your parent theme without the risk of breaking your child theme, keeping customizations in tact. Most theme frameworks provide instructions on how to create a child theme on their documentation page. Adopting the usage of a child theme helps saves time when tweaking or making A/B tests on your website. You can find simple, step-by-step solutions to creating your child theme here. There you have it. Future proofing your website isn’t an easy task, however the benefits in the long run are worth the effort. What are your tips and techniques for future proofing your WordPress websites? Please let us know in the comments below. Mahmud is a freelance tech/IT writer who loves creating awesome stuff online. He pens his experiences as an infovore.